Flat and satin finished in the center, this 8mm wedding ring is divided by two polished grooves. 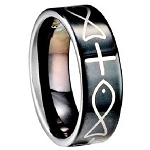 The outer two bands are flat and highly polished, giving this ring a classic look. Inside, it has a rounded comfort-fit design. A brilliant creation! 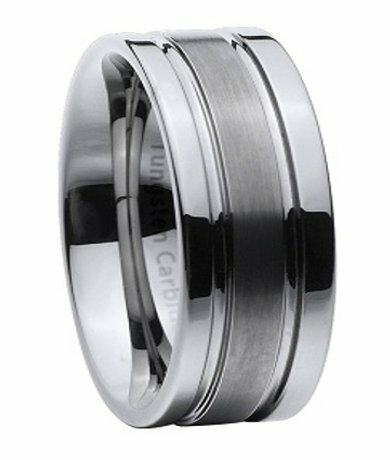 Comfort fit tungsten rings usually run 1/2 size larger, it is suggested you buy a half size smaller than your standard ring size. We recommend having your finger measured for a comfort fit ring at your local jewelry store for an accurate fit. All of our tungsten rings come with a lifetime warranty. To be honest I was skeptical about this ring because it was so inexpensive compared to my original ring, which I paid $270 for. I received the ring very quickly. The ring was very well made. I will say the brushed finish is a bit more glossy than depicted in the photo on the web site. This is a high quality ring and you will not be disappointed ! Very happy with our purchase, We are pleased with the ring and it fits comfortably and looks great. The brushed part is a bit more shinny then expected but we are still happy with the overall look of it. Great quality and detail.